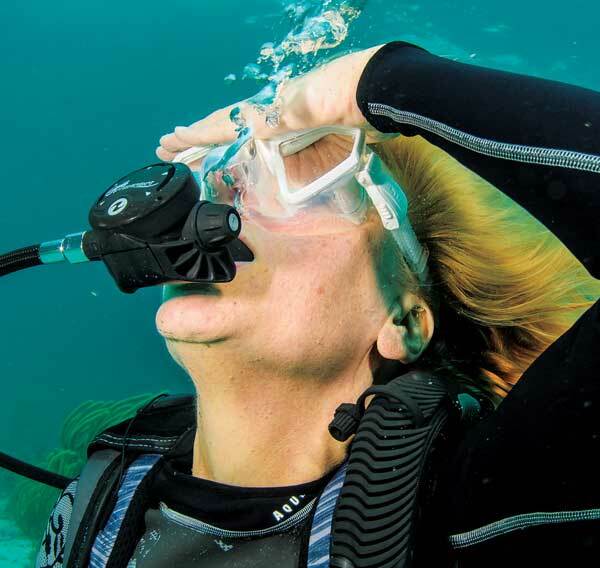 The only thing better than breathing easily through your regulator is viewing the underwater world through a clear mask. It’s a marvelous piece of equipment, the mask. Yet we hear it all the time: “This mask leaks.” As if it’s the mask’s fault. Masks come in all sizes to suit a variety of faces. The staff at your local dive center can help you select a mask that properly fits your face. But no matter what, at some point even the best-fitting mask lets some water in. This can happen when you smile, which can break the mask’s skirt, or sealing surface. Or perhaps you have a moustache that prevents a proper seal, or maybe a few strands of hair get caught under the mask’s skirt, allowing a leak. There are many reasons why water might find its way inside your mask. Fortunately, the mask clearing skill is easy to master and mask clearing takes mere seconds to achieve. Some masks have a purge valve built into the nose pocket, while others do not. Both types of masks use the same principle, displacement of water with air, in order to clear the mask of water. To clear any type of mask of water, you must exhale through your nose into the mask. As you exhale through the nose, press the top seal/skirt of the mask to make sure it remains sealed. How you secure the seal is up to you. Some divers use the palm of one hand to press against the seal, while others prefer a two-handed approach, using one or a couple of fingertips of each hand to secure the seal. The important thing is that the top seal stays secure while you exhale through the nose, so any water inside the mask gets forced down and out of the mask by the exhaled air from your nose. If your mask has a built-in purge valve, simply secure the top seal and look downward as you exhale through the nose. The water inside the mask will be forced out through the purge valve as you exhale through the nose. When you stop exhaling, the purge valve will seal closed, preventing water from entering through the valve. For masks without a purge valve, you’ll want to do the opposite. Tilt your head back a bit (look upward) as you seal the top seal and exhale through the nose. To practice clearing a nonpurge valve mask, start by tilting your head down slightly and breaching the seal on the top or bottom of the mask, letting a small amount of water to leak in (Photo 1). Experiment using the palm of one hand, or fingertips of both hands, to find which mask-clearing method you prefer. 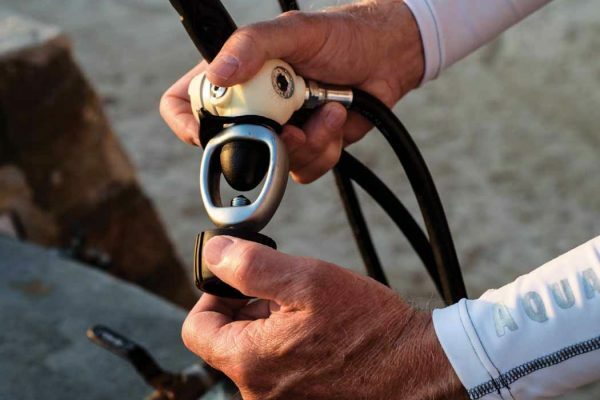 Some scuba instructors advocate one method over another, so ask the experts for their input. Even if you have a clear preference, it’s a good idea to be proficient with both techniques. 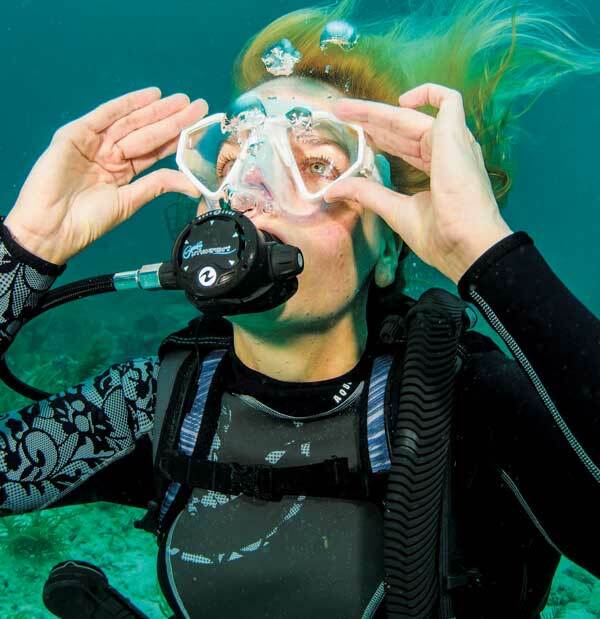 For instance, even if you find you like the two-handed technique, the one-handed method might prove necessary when you’re carrying a camera or holding an underwater light on a dive. [ONE] To practice mask clearing, start by tilting your head down slightly and letting a small amount of water into the mask. Photo by Barry and Ruth Guimbellot. 1. Using the palm of one hand. Place the palm of one hand along the top of the mask, pressing inward to keep the top seal in place. Exhale through the nose as you begin to tilt your head back (Photo 2). Continue exhaling until the exhaled air forces the water pooled at the bottom of the mask to escape. This is usually easy to accomplish on one breath — even for a fully flooded mask — but if more water remains, continue the clearing process. Simply inhale through your mouth and exhale into the mask through your nose. Once the mask is free of water, press the mask to your face to ensure it is sealed properly. [TWO] Place the palm of one hand along the top of the mask, pressing inward to keep the top seal in place. Exhale through the nose as you begin to tilt your head back. Continue exhaling until the exhaled air forces the water pooled at the bottom of the mask to escape from the bottom of the mask. Photo by Barry and Ruth Guimbellot. 2. Using both hands. Place both index fingers along the top of the mask, pressing inward to keep the top seal in place. Exhale through the nose as you begin to tilt your head back (Photo 3). Continue exhaling until the exhaled air forces the water pooled at the bottom of the mask to escape. If you wish, as you exhale through the nose you may use the thumbs of both hands to slightly (only slightly) break the bottom seal, allowing the exhaled air to clear the water from the bottom of the mask. When using your thumbs to break the seal, don’t lift the mask off your face or you risk allowing more water in than you started with. 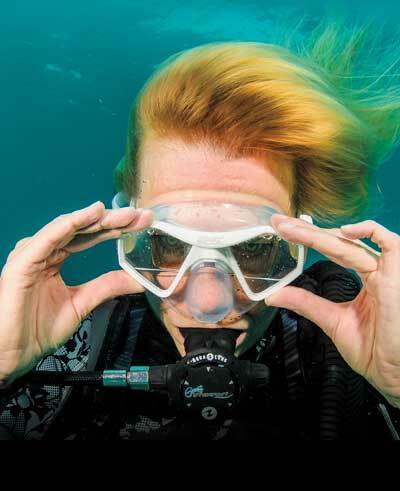 Just as with the “palm of the hand” method, this mask-clearing technique usually allows for easy clearing using just one breath — even for a fully flooded mask — but if more water remains, continue the clearing process. Once the mask is free of water, press the mask to your face to ensure it is sealed properly. [THREE] Place both index fingers along the top of the mask, pressing inward to keep the top seal in place. Exhale through the nose as you begin to tilt your head back. Continue exhaling until the exhaled air forces the water pooled at the bottom of the mask to escape. If you wish, as you exhale through the nose you may use the thumbs of both hands to slightly (only slightly) break the bottom seal. Photo by Barry and Ruth Guimbellot. Before you even begin letting water into the mask, it helps to start preparing for the mask clearing skill by getting the breathing sorted out; breathe in through the mouth the way you normally do, but exhale through the nose. Your exhaled breath shouldn’t be a sharp blast but rather a continuous exhalation. Remember: Do not inhale through the nose. When mask clearing, it’s inhale through the mouth, exhale through the nose. When water enters your nostrils, simply exhale through the nose to clear it. Start small. Add just a small amount of water to the mask at first, until you get the hang of it. When you discover how easy the mask clearing skill is to master, you’ll be clearing a fully flooded mask in no time.